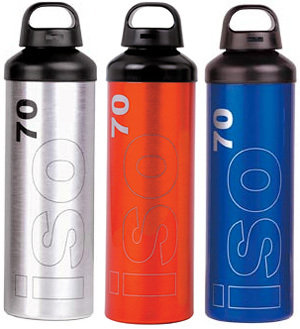 Laken ISO 70 Bottles Use The Magic Of Aerogel | OhGizmo! While it’s technically not magic, Aerogel is still pretty cool. It’s a glass-like substance that’s composed of 99.8% air and uninterestingly enough was the very first thing I every wrote about for OhGizmo! All that air not only makes Aerogel amazingly light, but it also works as a fantastic insulator which is why Laken is now using it in their ISO 70 aluminum bottles. The Aerogel-enhanced bottles will actually keep a beverage warm for twice as long as a standard aluminum-polyurethane bottle and will prevent your beverage from freezing when the temperature drops below zero. If that wasn’t enough, at 24 ounces it’s even half the weight of a traditional vacuum insulated bottle. At one time Aerogel was incredibly expensive but I guess the price has come down since the Laken ISO 70 bottles only cost about $59. swiggity sweet! and i also was not aware that aerogel prices had come down that much. where is my double-pane aerogel window!!! Aerogel is still very expensive in block/solid form. It is however pretty cheap in granular form. You can buy 100cc’s of the granular aerogel for less than 5 bucks. Its the formed solid stuff that is incredibly hard to find/buy. I am assuming they are pouring the grains into the walls of the thermos as apposed to getting the solid formed pieces. Great article on aerogel windows. With the reduction in cost, this has become a real option for many consumers.